Why do we look for heroes in all the wrong places? We’re stuck in our movie seats and in our history books, while today’s heroes go unnoticed. I pondered this question and its implications while sitting inside a Toyota Qualis in Ghaziabad, Uttar Pradesh. On the drive out of the city, back to Delhi, I noticed that the wide road was spotlessly clean and perfectly paved. No cavernous potholes, no rubbish clogging the drainage system, no plastic wrappers blowing by like tumbleweeds. “We’ve collected one crore rupees (Rs 10 million) of ‘lost’ money since July. All of it has been invested back into the city’s infrastructure and sanitation,” Ajai Shankar Pandey had told me. Pandey, the Municipal Commissioner of Ghaziabad, is one of those heroes who go unnoticed. But he prefers it that way, and insists on not being videotaped or recorded. Every morning, Pandey arrives to office ten minutes early and brooms the floor, dusts the furniture and takes out the garbage. He asks each of Ghaziabad’s citizens to make a similar effort. “When I arrived, I told the people of Ghaziabad, ‘There are sixty lakhs (6 million) of us. Imagine how much we could accomplish if we each did just ten minutes of work a day!’”Pandey sits at his desk surrounded by mountains of paperwork. His rich baritone voice, echoing around the sparsely furnished room, is full of earnestness and energy. Throughout the interview, Pandey simultaneously handles phone calls and signs documents. Pandey drew from Gandhian ideals when creating this initiative. The larger than life painting of Mahatma Gandhi in his office speaks of this devotion. While waiting for one of these phone calls to end, a wall-mounted board grabs my attention. It is covered with an array of letters from the citizens of Ghaziabad, all attributing Pandey with the monumental improvement their city has seen. What strikes me is their diversity: A small thank-you from a boy at the local middle school, a thick, glossy letter featuring an impressive letterhead and fancy signature from a local industrialist, a four-page, hand-written note in Hindi from a 65-year-old woman. When Pandey puts down the phone, I comment on the amazing outpouring of support he has received in just six months in office. Pandey begins the interview by recounting an incident that occurred in 1994, while he served as subdivisional magistrate in the Mathura district of the Agra division. “I’ve always had an interest in urbanity, so my whole life I’ve worked to understand it. I believe that man learns from experience, and one experience from my time in Mathura will always stay with me,” he says. One day, the sweepers suddenly went on strike and made impossible demands. Within a week, heaps of garbage lined the roads. All around the district, things became quite unsanitary and disgusting. I asked the citizens to help me dispose of the waste; they refused. I told them it was in their own best interest, but no one listened. Then, I asked the sweepers to call off the strike, and they refused. Now I have a real problem, what am I to do?” he asked. “I again thought of Gandhi, and decided to follow his teachings. Every day, I went out into the middle of town, carrying my broom, and I would proceed to sweep the streets and gutters. It was only me at first, so my effort didn’t make too much of a difference. People pointed and laughed at me. But after a few days, my colleagues began to help. “Three then five and finally ten joined me in the street. After five days, the citizens saw our sincerity, and began to help themselves. Soon, we had 1,000 people working for four to five hours each day. Seven days we did this. Finally, the sanitation workers came and begged us to stop. They wanted their jobs back, and agreed to stop the strike,” he remembers. Pandey says the incident taught him two things. After his experiences in Mathura and with his devotion to Gandhian ideals, Pandey felt compelled to make a difference, though he was unsure how to do it. It was another incident, in 2000, which finally propelled Pandey to formulate his plan. I was on a trip to Germany, and while in Frankfurt, I had what some might call an epiphany. “As I thought this, I noticed a young woman, who was dressed in expensive clothes, and was walking her dog. Suddenly, the dog stopped, and did his business. This woman immediately withdrew a plastic bag from her purse, collected the waste and deposited it in a nearby dustbin. That’s when it hit me: just ten minutes a day,” he says. 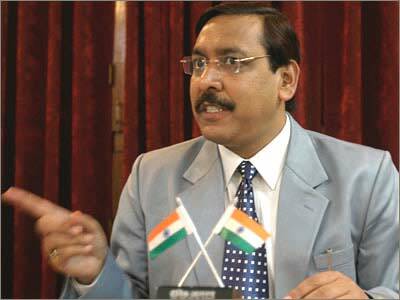 When Pandey took office on June 18, he found that Ghaziabad suffered from chronic corruption. It was so bad that city officials and hand-picked contractors had established an in-built 15 per cent hidden payment for each new project. In response, the populace became apathetic and the few honest contractors in town packed their bags and left. Civic sense had disappeared altogether. Pandey had found the right place to implement his plan. After sufficiently shaming them, he proposed a three-pronged plan meant to benefit both contractors and municipality alike. During those dark times, while others tried to humiliate him and sabotage his efforts, Pandey held onto lessons taught to him by his father. “I’ve always tried to emulate my father and his values. When I was younger, he told me that perseverance always prevails. He said, ‘Whenever you try to do something great, they’ll make a joke of you. But if you can withstand their taunts and stand strong, you have made it past the first stage. Then, in the second stage, they oppose you. They may even try to do you harm. But if you can pass that stage — it’s a very difficult thing to do — then you will succeed. So Pandey blocked out the negativity, and worked to bring a positive outlook to his office based his approach on three tenets: Honesty, transparency and teamwork. He expects each city official to embrace these values with the same passion he does. “He’s the best employer I’ve ever had. It is a dream to work for him. At the core, he operates in a very simple way. He’s completely honest; he never says one thing in a meeting only to tell me something different behind closed doors. It’s a refreshing experience,” says Arun Kumar Mishra, an accountant working for the municipal corporation. Pandey had planted the seeds of change, and slowly, they took root and blossomed. After the interview, Pandey hands me a ceremonial gift, the same he gives to each visitor to his office: A brand-new jhadu.